Call and Instructions by José and Lloydine Argüelles (Valum Votan and Bolon Ik). Day Out of Time 2000: “The Rainbow Bridge” (First version). Complementary Rainbow Bridge Meditation uploaded in 2002. Published on historical Tortuga’s website (2000). The Circumpolar Rainbow Bridge event, Day Out of Time 2000, completes the Seven Years of Prophecy. What is it? How are we to understand this event? The Rainbow Bridge is Earth’s aura made visible. This aura – Earth’s electromagnetic field – is regulated by a day alternator and night alternator. The alternators regulate the photon emission of the sun by day, and the photonic regeneration by night. The alternators create the two sides of the Rainbow Bridge, 180 degrees apart. The rainbow is already there, we just have to “see” it. The sun is currently at the mid-point peak of its 23-year sun spot activity cycle. Because of this, the Earth’s magnetic field, including the auroras and phasic alternators, are saturated with plasma which has already been producing unusual rainbows around the sun and related spectral or plasmic rainbow phenomena. This activity is all part of a quickening process which is an inevitable aspect of Earth’s evolution. With the discovery of the Law of Time, we have been able to synchronize human consciousness with the solar activity (Coronal Mass Ejections or CMEs) in relation to Earth’s poles, auroras and magnetic field. Beginning July 21, 2000, Cosmic Moon 25, and for five days through the Day Out of Time, we have called for advanced practitioners, or chrononauts, to begin a coordinated telepathic exercise. The purpose of this exercise is to place at least a minimum concentrated element of human consciousness in phase with the Planet Holon – the etheric structure coordinating Earth’s chronosphere, or timing regulator. The day and night phasic alternators are the “motor” of the chronosphere. Because of the human telepathic synchronization with the chronosphere we can anticipate the possibility of an “Earth Shift” – a change in the frequency or orbital ratio of the Earth which would be experienced, at least subliminally, by all that lives. The Rainbow Bridge is the solution to the problem: how is consciousness released from the atom? The answer is given by applying the law of Time, T(E) = ART, where T = the 13:20 timing frequency coordinated to the minimum five day sequence or overtone time chromatic by (E), the human consciousness telepathically attuned to the bipolar electromagnetic field of the Earth with the purpose of making visible the day-night phasic alternators = ART, or the Circumpolar Rainbow Bridge. While only small cadres of humans will be actually doing the five-day exercise, all humans are being called upon to participate or in some way to acknowledge and be aware of the Day Out of Time, Tuesday, July 25, White Resonant Mirror, and to imagine or envision a rainbow around the Earth. This activity in itself completes the Time Shift begun exactly eight years ago. What is the Time Shift? According to the analysis of the Law of Time, all of life on Earth is governed by a common universal timing frequency, mathematically represented by the ratio 13:20. Only the humans have deviated from this frequency, operating instead by the mechanistic and artificial 12:60 timing frequency. 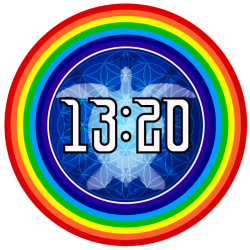 As of July 26, 1992, through a concerted effort, a small element of humanity began to become aware of the possibility of returning to the natural timing frequency through the adoption of the regular and harmonic Thirteen Moon Calendar. The Time Shift refers to the shift in perception and consciousness away from the 12:60 and back to the 13:20 timing frequencies. As of the Day Out of Time 2000, this small element of human consciousness operating by the 13:20 timing frequency has come to constitute a minute but critical mass of the entire human species dispersed around the globe. Because the Time Shift had actually come to encompass many different groups of people in all parts of the planet, it has actually sparked the beginning of a Mind Shift. The Mind Shift is defined by a global awareness that the current Earth culture cannot continue according to its unexamined premises without precipitating its own demise, and that a fundamental cause of the human-planetary disorder is its operating by a defective and artificial timing standard. This Mind Shift was made conscious July 26, 1997 and has since been expanding as a rolling and evolving wave of awareness, that is inclusive of the definition of the Biosphere-Noosphere transition. This describes the critical stage when the evolution of life is no longer continued at the biological or physical level but enters a truly mental and spiritual stage of progression. In this context, the application of the Law of Time becomes the gauge for determining the advance of humanity into the noosphere – the mental sphere of the planet. The attainment of the noosphere cannot come about except through a a radical discontinuity of the life program, that is, the cessation of the 12:60 way of life, either through humankind’s own moral decision, or through the absolute disruption of the industrial civilization by over-extension of its own unexamined methods. 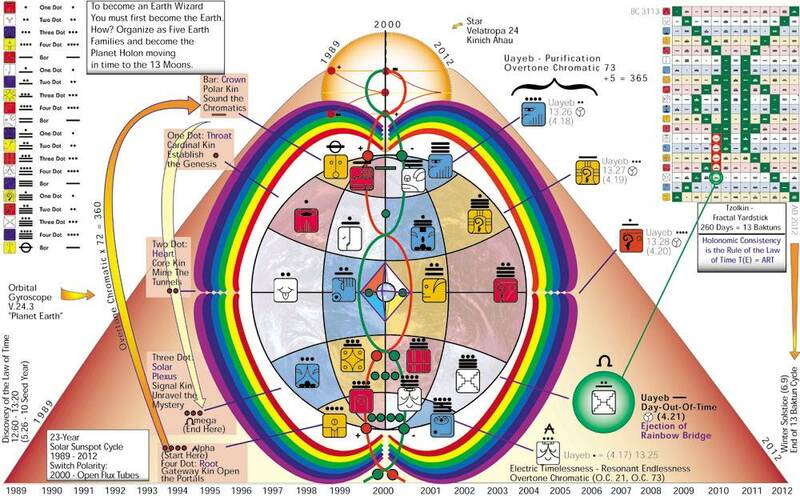 The discovery of the Law of Time, inclusive of the seven-year rise of the Thirteen Moon Calendar Change Peace Movement as the force of the critical mass synchronized with the peak of the current solar excitation cycle, pivoted on the day Out of Time 2000, results in the Consciousness Shift. This defines the actual advent of a new kind of consciousness as a result of the application of the Law of Time. Consciousness of the true nature of time can only have meaning through concerted group attunement and action at a global level. This is the purpose of the concentration on the Day Out of Time 2000 as the synchronization point of this new consciousness. The staging of this new consciousness synchronized at a precise moment in time, registering the solar-electromagnetic perturbations upon the planetary field, establishes the opportunity of triggering a phase shift, literally a change in the Earth frequency through an application of human consciousness directed toward a specific goal – the Rainbow Bridge. The phase shift is a radical displacement of the Earth into the future through a process of teleportation. Being a function of the solar evolutionary cycle, the Earth is already poised for such a shift as a natural part of her mutation into a new geological era – the Psychozoic era. The Law of Time makes it possible for the critical mass of human consciousness to precipitate and participate in this phase shift. The phase shift is like pushing the ”fast forward” button to a point in time space where Earth has already cleared itself of the distorting frequencies of the erroneous 12:60 human civilization. Through the entire Day Out of Time 2000, White Resonant Mirror, the object of this phase shift should be maintained as a point of meditation by those who can sustain such a thought. The appearance of the Rainbow Bridge will be dependent upon the successful completion of the exercises of the chrononauts as well as the awareness of a mass of humanity attuned to these objectives. The resultant effect by the dawn of Blue Galactic Storm, July 26, 2000 would be the Earth Shift – the jump of Earth into a time space continuum which is already accustomed to the experience of a “radiosonic bath.” The radiosonic bath is defined as the normalization in the atmosphere and electromagnetic field of new levels of plasmic and photonic saturation such as make the Circumpolar Rainbow Bridge a continuously visible presence and feature of planet Earth. It must be understood and remembered, that while all of this may seem to be a complex process, it is merely a description of the synchronization of various forces and activities already set in motion and which definitively establish the role of human consciousness evolving into time. The dolphins, the trees, the oceans and the rivers, the sun and the moon have never left the 13:20 timing frequency. They are all awaiting the inevitable demise of the 12:60 timing frequency. The demise is inevitable because the 12:60 is false, and the true always outlasts the false. By participating in the visualization of the Circumpolar Rainbow Bridge, we are overcoming the force of electromagnetic resistance around the equatorial zone of the Earth – the tropopause – that keeps the northern electromagnetic field separate from the southern electromagnetic field. This represents the overcoming of the dualism and separation which have characterized the most recent stages of human mental development and which promises, thereby, the advent of a stage of unified consciousness – UR – the Universal Religion or Universal Recollection. To facilitate this process, a further telepathic visualization instruction is offered, the Northern and Southern UR Domes. During the five-day cycle, July 21- 25 (Uayeb, the last five days of the 365 day solar orbital cycle measured by the Thirteen Moon Calendar), visualize these five days as a set of concentric circles creating a great time space UR Dome. The five concentric circles represent the five stages of the movement in time of the Earth Families as a five day process. At the center of each of the UR Dome visualizations is the octahedron crystal Earth Core with the 28-point master time molecule. The Earth Core is visualized as co-extensive with either the Northern Pole or the Southern Pole holding the center of the UR Dome. In the Northern hemisphere visualization, on July 21, White Electric Wizard, the movement begins at the outermost concentric ring, jumping on July 22, Blue Self-Existing Eagle to the innermost ring, then moving outward, ring by ring, until it reaches the fourth ring out, White Resonant Mirror, the Day Out of Time. In the Southern hemisphere, July 21, White Electric Wizard, is represented by the innermost Ring jumping on July 22, Blue Self-Existing Eagle, to the outermost ring, then moving inward, ring by ring, until it reaches the second ring from the center, White Resonant Mirror, July 25, Day Out of Time. The visualization should be maintained during the five day Uayeb by teams in the Northern and the Southern hemispheres. Groups should practice lying down in a circle, heads to the center, visualizing according to their hemispehre. The object is to neutralize the spin of the Earth (the teams are creating movements in two different directions simultaneously) so that by the Day Out of Time the polar axis spin is stopped long enough, just the blink of the eye, for the Earth to advance 1000 years from its present time vector locus. In this way, the Day and Night Ring Alternators made visible for only a moment in the “present” of the year 2000, would become, in the next instant, 1000 years “later,” the Circumpolar Rainbow Bridge, a permanent transorbital feature of planet Earth, Velatropa 24.3. Making conscious what was unconscious, let us look forward with joyous hearts to the completion of the Rinri Project – the Manhattan Project of the Creative Imagination! The Day Out-of-Time is a worldwide peace celebration that occurs every July 25th. It is celebrated in over 100 cities in Japan, a song has been written about it by the Japanese group Love Notes. It is observed in 80 cities of Brazil, and festivities stretch from Moscow and Saint Petersburg to Glastonbury and Central and South America. In the United States a Day-Out-of-Time festival was held in Portland, Oregon. The Chief of Police, Mark Kroeker, was given the Banner of Peace by José and Lloydine Argüelles as shown in the photos. Afterwards, music and festivities continued throughout the day and into the night. The Day Out-of-Time is the day to celebrate peace, cooperation and forgiveness. It is the day for the arts and music. The artist has tremendous power to change the world. This is the day for artists to speak to the world through their voice, music, and art. It is now that the artists can let the world know how art can unify, heal, bring people together, and transcend boundaries, language, and all of the barriers that our minds have set up through history. On the 13 Moon Calendar July 25th is no day of the week and no day of the month. There are thirteen moons of 28 days each which makes 364 days plus one day, The-Day-Out-of-Time. Please join us to make the next Day-Out-of-Time 2001 an unforgettable day around the world. The Day Out of Time, Yellow Solar Star, July 25, 2002, is now approaching. This year there will be more than 500 Day Out of Time events happening world wide – signs that the Day Out of Time has become an annual planetary day of festival such as has never been known in all of history. For this reason it is important that as many groups as possible also hook themselves up with the Earth and with each other through the Rainbow Bridge Day Out of Time World Peace Meditation. 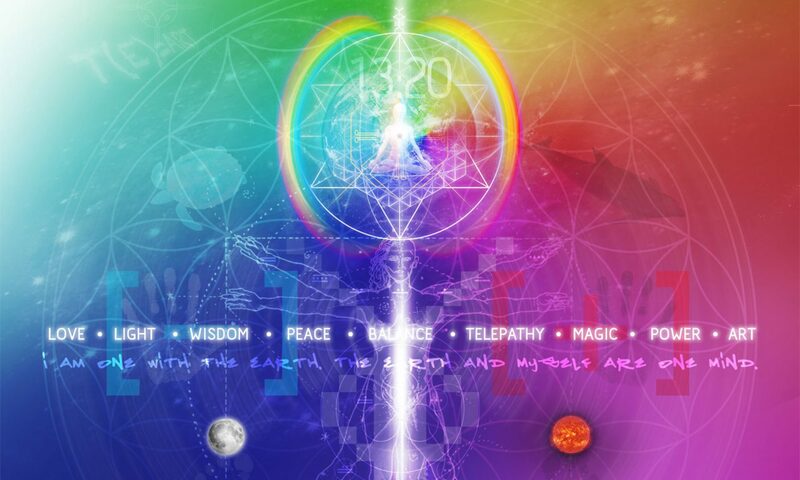 The purpose of this Meditation is to generate a telepathic wave of love that connects ourselves with the center of the Earth, with the bipolar rainbow alternators that hold Earth’s magnetic fields in place, and with all of the other planetary kin who are doing the same meditation. By establishing this world-wide telepathic Earth wave we are creating a matrix of communication which brings the noosphere – Earth’s mental envelope – ever closer into conscious manifestation. This matrix also provides a protective field of genuinely positive thought vibrations meant to maintain Earth’s resonant field in a state of harmony and peace. by the closing of the cycle, Winter (North) Summer (South) solstice, 2012. This Rainbow Bridge is the bridge of peace long prophesied that will permanently connect the third-dimensional Earth with the fourth and higher dimensions, assuring a peace and harmony that will not be able to be broken. In order that all beings may participate in this meditation whether or not they have ever heard of the synchronic order, we offer this universal version of the Day Out of Time Rainbow Bridge World Peace Meditation. You may do this alone or in a group – early in the day is best, but whenever you do it is fine. If you are in a group, gather in a circle if you can, seated on the ground or floor if possible, with your legs crossed. Take a few deep breaths, inhaling what is negative, transmuting that within yourself and then exhaling what is positive and purifying. Then close your eyes. Visualize that you are in the center of the Earth. Then visualize the giant octahedron crystal core. Four faces of the crystal end in a point along the North polar axis. The other Four join at a point aligned with the South polar axis. Surrounding the giant octahedron crystal is the Earth’s inner membrane, like a drum resonating the surface of the outer Earth. The Northern half of the crystal has two red and two white faces; the Southern half has two blue and two yellow faces. Now you go inside the crystal. In the center of this giant crystal is an intensely blazing point of white light. An etheric column or axis of light extends North and South from the blazing center point through the tips of the octahedron going on to the North and South poles at the Earth’s exterior. Around this etheric vertical magnetic axis of light, are two intertwined flux tubes through which plasmic energy is continuously passing. Coiled around each other like the two strands of DNA, the flux tubes are red and blue in color. They deliver plasma -electrically charged ions – to the blazing point at the center of the Earth. The gravitational plane of the octahedron crystal, emanates horizontally out from the blazing luminous center of the crystal, extending to the the four points that mark the edges of the crystal, where the four northern and four southern faces of the octahedron meet. The gravitational plane connecting these four points is like the base of two pyramids – one pyramid extends from this base with four faces to the northern point of the octahedron, and the other four faces to the southern point. Along this gravitational plane exactly opposite each other are two more time atoms: a white one and yellow one. These two gravitational time atoms are constructed just as the the red and blue polar time atoms, except that their two axial points are aligned with the gravitational plane, lying on their side as it were and perpendicular to the polar time atoms. These white and yellow time atoms turn around like paddle wheelers making a slow circular motion, counterclockwise, from left to right around the central point of blazing luminosity. Once you have visualized the octahedron crystal core of the Earth with its eight faces, four time atoms, etheric column of light and two flux tubes, then visualize that from the center of the crystal a great stream of multicolored plasma filled light shoots up in both directions toward both of Earth’s poles. Now you have gone from the center of the Earth to a point out in space where you are seeing the whole Earth. While you can still see the crystal octahedron at the center of the Earth, at the North and South poles the stream of light shoots out to become a great double rainbow bridge -the day alternator and the night alternator of Earth’s magnetic field made visible. Two rainbow streams connect the North and South Poles of the Earth, exactly 180 degrees apart from each other. As the Earth slowly revolves on its axis, this rainbow bridge remains steady and constant, unmoving. Once you have completed the visualization take the whole Earth revolving beneath the rainbow bridge and place it in your heart. Imagine the two streams of light shooting out through your central column above your head and beneath your feet. Now they make a similar rainbow bridge around your body, holding your aura in place. Now you and the Earth are one. The Rainbow Bridge of World Peace is real. There is a science behind all of this. What exists at first in the imagination, visualized by enough people in a telepathic wave of love, will in time become a reality.